On this "International World Youth Skills Day" The Official One Million Book Donation will commence; giving back to society recipients will benefit from a Career, Entrepreneurship & Employability Book. To become a beneficiary, sponsor book copies, partner or participate in the launch, please send an email today. On "Poverty Eradication Day". ECC will award humanitarians and unveil projects to feed the mind/body. 4OurGem to feed widows, orphans, IDP's, Literacy to Alleviate Poverty (L2AP) Book Donation for the unemployed/edutainment to develop valuable life and career skills. To participate, sponsor or partner make contact. During the Entrepreneurship Week ECC will bring together world leaders, diplomats, diaspora leaders, entrepreneurs, professionals, friends and partners of ECC to discuss the enterprise capacity and unemployment issues facing the world, and enable entrepreneurship practice and policy interventions. Unveiling the worlds 1st Entrepreneurship Career Theory Framework and Day. To celebrate, participate, sponsor or partner please call or send us an email today. 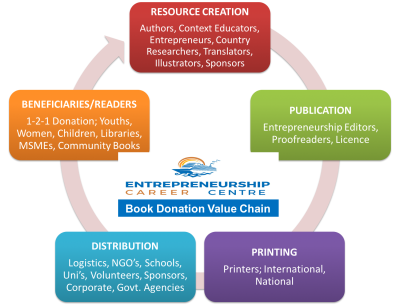 Through education, edutainment, career speaking tour & books donations we will pay tribute to books & authorship encouraging all to discover how entrepreneurship book magic can expand the mind and teach forever to enable individual skills, enlightenment, personal development, national harmony and progress.